This window, at the south side of the alter of Dorchester Abbey, contains many fine examples of Decorated Gothic tracery from the late 13th century onwards. Dorchester Abbey is located on an early Christian shrine of St Birinus and dates from 634. The abbey building was originally a cathedral but in 1170 it became an Augustinian abbey. After the monastery was dissolved in 1536 the monastic buildings were almost entirely destroyed. 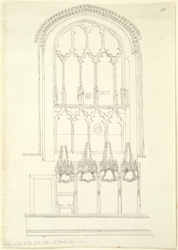 The church was then purchased by Richard Beauforest of Dorchester, who presented it for the use of the parish.